This post was first published in the Journal of Victorian Culture Online. I am very grateful to the Editors for permission to re-publish it here. In the introduction to his book The Gothic Revival 1720-1870 (2002), Michael Charlesworth discusses the concept of ‘living the Gothic’, describing it as a point where the architectural and artistic intersect with the literary to form what we understand as Gothic, in interdisciplinary, cultural terms. He points out that the aspiration to ‘live’ the Gothic was often inspired by literature, as well as architecture, and also in turn inspired further literary works. Charlesworth discusses Beckford and Byron, among others, but his particular focus is, unsurprisingly, on Horace Walpole. 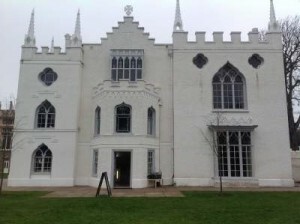 Recently I visited Walpole’s Gothic castle, Strawberry Hill. 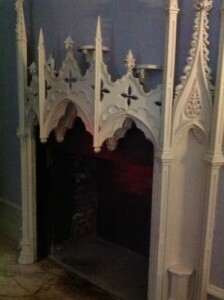 Although most of his objets d’art have now gone, it is possible to see in the restored decoration the ways in which Walpole recreated the Gothic of Renaissance architecture (there is an excellent video about the restoration of Strawberry Hill, and a database of objects owned by Walpole, at the Lewis Walpole Library at Yale). For Walpole, looking at historic buildings when on his Grand Tour didn’t fulfil his ambitions; it inspired him to recreate the “gloomth” (his word) of ancient buildings in his own home, and to begin a hugely influential literary genre of Gothic which both has its roots in the past as well as continuing through the nineteenth century on into modern versions in film and television as well as books. Looking and reading wasn’t enough; Walpole had to ‘live’ the Gothic. This post is not only inspired by my visit to Walpole’s castle, but also by the fact that I am in the chaotic process of restoring a nineteenth-century house. Once the roof, windows and heating have been sorted out, my focus will be firmly on the furnishings, so I have spent some time recently wandering around antiques shops and looking online at Victorian-style fabrics, reproduction Morris wallpapers and restored door knobs, etc. There is a plethora of books available on restoring and decorating Victorian houses, from the more scholarly manuals of style and books on Victorian taste, to the eminently practical books of advice from the Victorian Society. There are websites which specialise in selling reproduction Victorian décor, some more apparently authentic than others, while books such as Judith Flanders’ The Victorian House: Domestic Life from Childbirth to Deathbed (2003) cater to both an academic and a popular market. There is clearly a great deal of interest in Victorian houses today, and though they may not be to everyone’s taste, it is fairly easy to see why: they are plentiful, often attractive, and in many ways still very practical to live in – more so than, say, beautiful but tiny ancient thatched cottages. The interior style is also easier to reproduce than earlier styles, and more convenient for modern families. 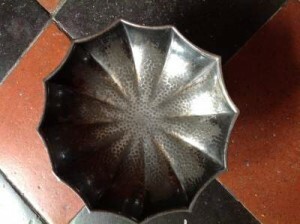 Owning things that are old and authentic holds a strange fascination, as though the objects are themselves imbued with a kind of historicity which rubs off on us when we touch them – like some kind of medieval relic. Visiting a library to work with a manuscript of an author’s work, in their writing, can be an incredibly exciting event for a scholar (I’m assuming I am not alone in this!) for similar reasons: we attach emotions to these objects because they seem to offer us some kind of authenticity, a way of reaching toward the past. Benjamin also wrote that ‘Every passion borders on the chaotic, but the collector’s passion borders on the chaos of memories.’ The collecting of historical objects, whether Walpole’s gloves of James I or my more modest fruit bowl, pays tribute to a collective cultural memory of the past which, among other things, is linked to a kind of nostalgia. I often think that in academia, nostalgia is an uncomfortable term, usually used in a kind of derogatory way, particularly because of its association with sentiment, another difficult term which was addressed by Tate Britain last year in an exhibition called ‘Victorian Sentimentality’. Yet it seems difficult to me not to feel a kind of nostalgia for what is, after all, so familiar and comfortable, so ensconced in our cultural history, with a cosiness which is probably entirely imparted by misconceptions. The memories of the books and poems I have read over many years, the pictures I have seen (and, probably, the costume dramas I have watched, too) mean that I have a very clear sense of the Victorian home, and it seems one that is genuinely homely, one worth recreating and living in, I think. Clearly I am not alone in my desire to ‘live’ the nineteenth century (though I can easily resist the clothes), but I often wonder whether this is unusual, and secretly suspect that most Victorianists live in minimalist white houses which are pristine and contain perhaps one or two Victorian books, at most. All photos (c) Serena Trowbridge, 2013.